1. 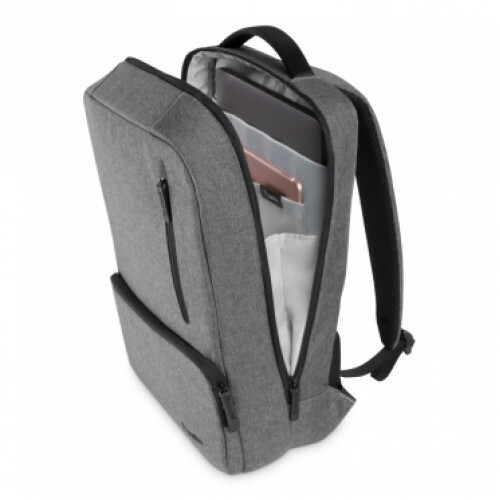 A padded inner pocket is designed to protect laptops up to 15.6" while dedicated pockets keep items like tablets and battery packs safe. 2. Padded back panel and adjustable padded straps keep you comfortable, even on long commutes. 3. Essential items are always within reach thanks to a vertical outer pocket with a zipper closure. 4. Accordion-style design makes opening the bag upright and finding items inside simple. Essentials are quickly accessible from the front pocket, just swing the bag around and open. Accordion Opening allows for easy access to an organized mobile office. Inside a dedicated pocket protects your laptop or tablet. A clean and modern design that complements your style. Heather grey with simple black details, this bag looks great from commute to the boardroom.